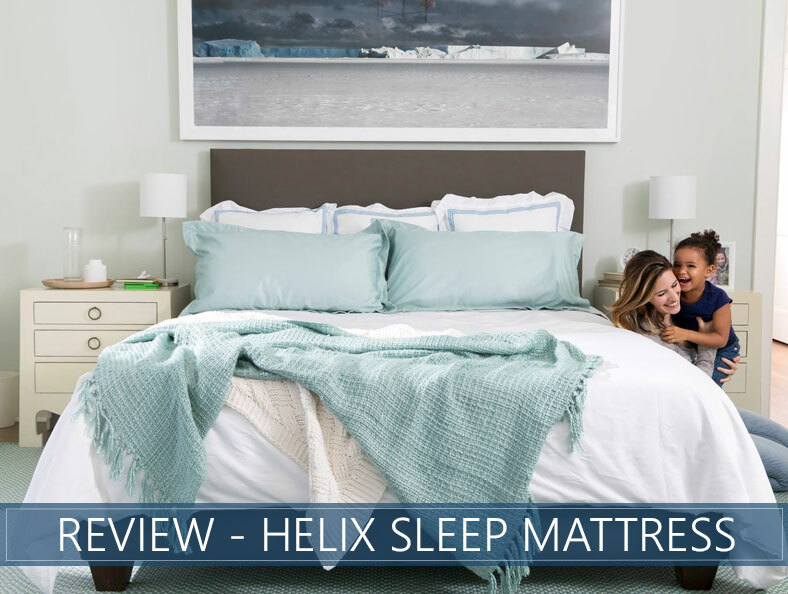 Helix Mattress Review for 2019 - Is The Customization Aspect Worth It? Are you overwhelmed by the customization choices in the mattress industry? Are you seeking a little guidance on what feel would work best for you? Helix’s newly updated customization process is looking to introduce a little color to the bed shopping process, and their new system offers nine different choices with different colored covers. The company’s quiz will assist you in your selection process, as well as recommend a split comfort if you and your partner have different preferences. In our in-depth Helix mattress review, we will discuss features like support, quality, and cooling to see how the new upgraded brand stands up to pressure. Helix offers two options in three different firmness levels, as well as a bed for heavier folks and dual-sided mattresses. Our review will look at the Helix Dusk, which we think is likely to offer the most versatility. Stick around and read our point-by-point breakdown, or circumvent the specifics and go straight to the end for our summary. Want guided customization – It can be hard to choose a feel and firmness when selecting your own bed, but this brand makes it easier with their quiz, which is based on an algorithm that analyzes your sleep profile. By taking the guesswork out of bed shopping, Helix helps to better ensure a good fit for their customers. Are shopping for a hybrid – Both innersprings and foams offer advantages as a bed construction materials, and with this hybrid, you get a little of the best of both worlds. The springs provide airflow and bounce, while the foams conform to your shape to relieve pressure. Have a partner with different sleep preferences – Many couples do not share a body type or sleep preferences, and a bed with dual-sided firmness can help both partners get a better night’s rest with a feel that’s chosen specifically for their individual needs. Prefer an all-foam bed – The bounce and airflow of innersprings offer many advantages and the individually pocketed coils will help reduce motion transfer, but the feel will have slightly more bounce than you might expect in an all-foam construction. Helix is a customized bed-in-a-box hybrid that can be unwrapped and installed on many different kinds of bed frames provided you use a bunkie board or a foundation sold through their site. If you’re interested in adjustable frames or even a simple black metal frame, those are also available through the company’s website. Each mattress model has two covers. The first is a soft 100% polyester stretch fabric that can be zipped off and machine washed, and the second, which is designed to enhance breathability, is made from a jersey knit fabric. If you tend to sleep hot, you may consider their specialty cover, sold separately, that incorporates phase change technology that works to keep temperature constantly stabilized. All nine of the different iterations of the brand will differ slightly in construction, but all but the Helix Nightfall, which was built for heavier sleepers and is two inches taller, stand 10 inches high. This construction refers to the Helix Dusk model. The first layer is built with the company’s proprietary Helix Dynamic Foam, which is a body-conforming latex-alternative that is breathable and gives the surface a small bit of bounce. The second layer transitions to the support system with a piece of High-Grade Polyfoam for extra body conformance and support. The third layer is an innerspring unit made from coils that are reinforced for edge support and help to isolate motion because they are individually pocketed. This unit should conform to your shape while holding your spine in alignment. The base layer provides the foundation of the bed with DuraDense foam that supports the structure of the bed. It also helps the bed remain more durable. Models that are made for “all sleep positions” contain only the latex alternative, but you should note that the models made to provide additional pressure relief include a layer of memory foam. Helix does not print specific measurements online, but they do vary from model to model. 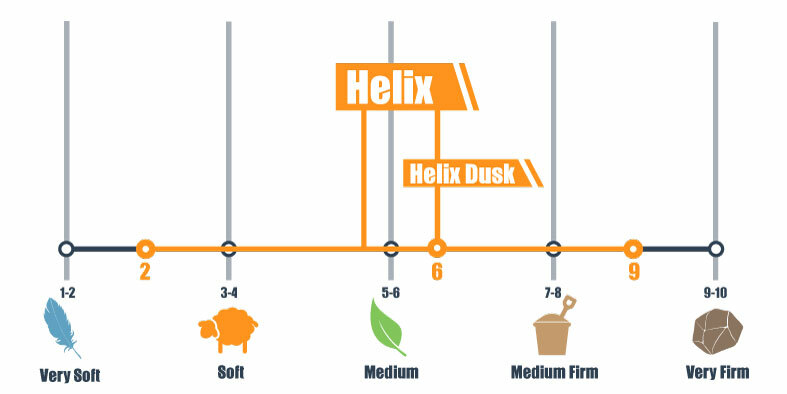 The firmness of Helix will vary widely depending on which model you select and can fall anywhere between a 2 and a 9 on our scale that goes from 1 to a firmest of 10. For the Helix Dusk, firmness is approximately around a 6, which tends to be very versatile and therefore exceptionally popular. If you have more specific needs, however, Helix is happy to oblige you with more choices. Lying down on the Dusk, you should sink immediately into the soft latex-like foams for pressure relief but should have no problem rolling around on the bed as the material is quick-responding and has a moderate bounce. Coils and the firmer support foams also assist with repositioning. Dusk was designed specifically for a combination sleeper of average weight who prefers a Medium firmness, so if that sounds like you, you will most likely be matched with Dusk when you take the quiz. For back sleepers, there is enough good comfort material here to conform to your lumbar while supporting your back in a neutral position. Heavier sleepers or those who prefer a firmer bed, there are two more options for you in the Twilight and Dawn models. Most side sleepers should feel perfectly comfortable on Dusk but if you are wanting a bit extra pressure relief while still sticking with a versatile Medium firmness, you may want to check out Midnight, which includes memory foam to cradle your pressure points. Side sleepers typically need to be mindful of pressure because they sleep with all of their weight on a smaller area. Lighter than average or those in the market for a lot of pressure relief may want to stick to the plusher models. And finally, stomach sleepers should feel supported in Dusk especially if this is not their primary position or they tend to switch things up a lot. Firmer choices may be preferable for exclusive stomach sleepers so they can ensure their hips don’t dip and overarch their spine. The manufacturer recommends Helix for sleepers up to 350 pounds or couples who weigh a maximum of 250 each. If you or your partner are substantially larger than average, the company has also created a bed called the Nightfall that is built to accommodate a combined weight of 1000 pounds. Helix performs surpasses expectations for hybrids in this space because of the amount and quality of foam it contains, as well as the individually wrapped coils that help trap motion at its source. If you’re a light sleeper concerned that motion from the other side of the bed will wake you, you shouldn’t have much concern with this hybrid. Helix performs above average for edge support compared to other bed-in-a-box brands, and this is due to their newly updated edges that contain reinforcement in the coil unit. There may be some compression in the comfort foams when you sit with all your weight on the side, but lying on the side should feel comfortable and secure. Couples who need more space to stretch out typically appreciate strong edges. Multiple Firmnesses and Feels – This company offers 9 different models based on the results of a sleep quiz you take on their website, which will recommend a feel and firmness to provide your best sleep. Trial Period – You can keep the bed in your home for 100 nights to decide if you want to keep it. If you change your mind or feel it is not the right fit, you can return it for a full refund. Shipping – This brand ships within the US and Canada. CertiPUR-US® Certified – All of the foams contained in this mattress have been tested for harmful chemicals and have passed a third-party standard that checks for potentially dangerous emissions. The Helix Nightfall and dual-firmness options cost extra. Finding your perfect bed just got easier with Helix’s brand new Color Match system which takes your individualized input to select a feel—or dual-sided feels!— that will work great for you and your partner. If you’re shopping for a mattress and aren’t quite sure what feel that you require, Helix’s quiz and Color Match system may be the key to unlocking your best sleep with minimal hassle. Their state-of-the-art system, which is based on expert opinions and artificial intelligence, was designed to improve their customer’s sleep by providing a better match. The features of this mattress were thoughtfully constructed to deliver options whether you were looking for a mattress that stays cool all night, if you needed one to cradle your curves with a thick comfort system, or both! The reinforced coil unit should provide good edge support and motion transfer is at a minimum with their individually pocketed construction. Hopefully, we’ve given you some idea of what the average sleeper can expect from this bed, but it truly does offer an impressive range of customization with an option for literally every specific need or desire. Your next best sleep may just be a short online quiz away. 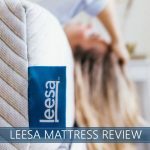 Our Leesa Bed Review For 2019 - Should You Buy It? - CONS: I've had my Helix mattress for about a year. I weigh 350 pounds and am 6' 5", it has developed a significant depression. I do not recommend this product at all. We are so sorry you’ve had a negative experience. Have you discussed your concerns with the company? They currently offer a model that addresses the concerns of heavier sleepers, and that may be better suited to your needs. Thanks for reaching out, Chris.